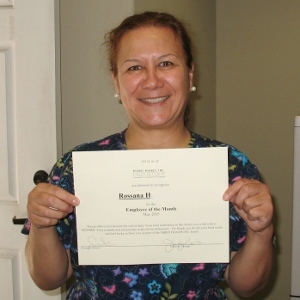 We are honored to introduce Rossana as our May 2015 Caregiver of the Month in Pleasanton! Rossana brings a wealth of knowledge to work everyday, and specializes in working with our clients experiencing dementia. Outside of work, she enjoys traveling, soccer, and movies. On top of that, she is fluently bilingual in English and Spanish, and has a beautiful Siberian Husky. Hmm… if there were only a movie about a Spanish speaking dog that plays soccer abroad! Rossana, we tip our hat and Thank You for everything you do! We’re proud to have you on our Team!